An old postcard view of the Lincoln Park Doughboy. The bayonet appears to be missing. Smithsonian Art Inventory Control Number: 47260020. Formerly standing near the northwestern end of Diversey Golf Course, east of intersection of West Briar Place and North Lake Shore Drive. The statue no longer exists. Our thanks to Andrew Schneider of Chicago for providing the information that was once on the plaque, and to Teresa Rodriguez for a family photo actually showing the plaque with readable text. The statue was dedicated by the Kiwanis Clubs of Chicago. It was erected through the efforts of all Chicago Kiwanis Clubs and dedicated on Armistice Day, 1927. More than 3,000 Kiwanians, and members of the National Guard and high school R. O. T. C. took part in the unveiling cermonies. Each Kiwanian of the 19 Kiwanis Clubs in Chicago at that time conributed $1.00 through his club to make this gift possible. It was presented in a fitting tribute to the men and women who took part in the World War. The idea was conceived by Dr. Thomas A. Carter, immediate past president at that time of the Chicago Kiwanis Club. 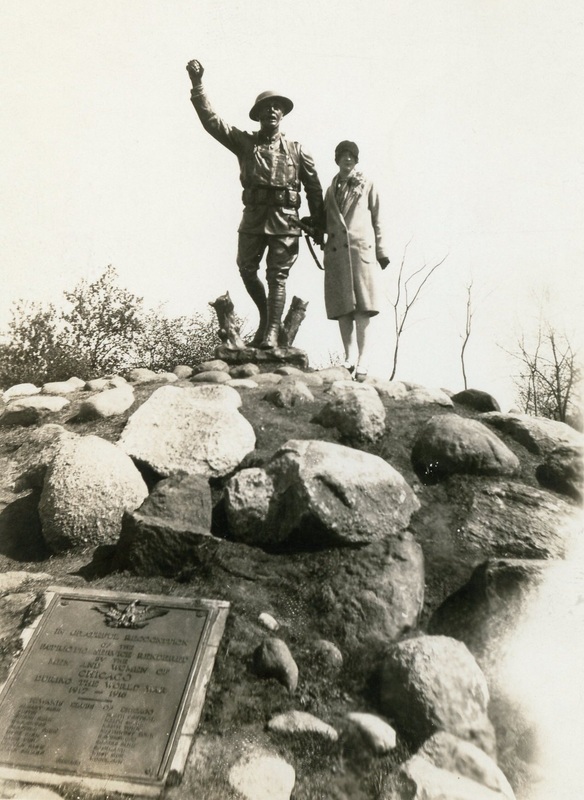 At the dedication, Col. Clarence S. Chamberlain, Atlantic flier, spoke on the influence that the war had on aviation; Fraulein Rasche, noted German Aviatrix, also spoke, and Senator James Hamilton Lewis, the principal speaker, spoke of the Doughboys' work in France. Unfortunately this Doughboy no longer exists, and no information has been located indicating what happened to it after it was taken down in 1946. 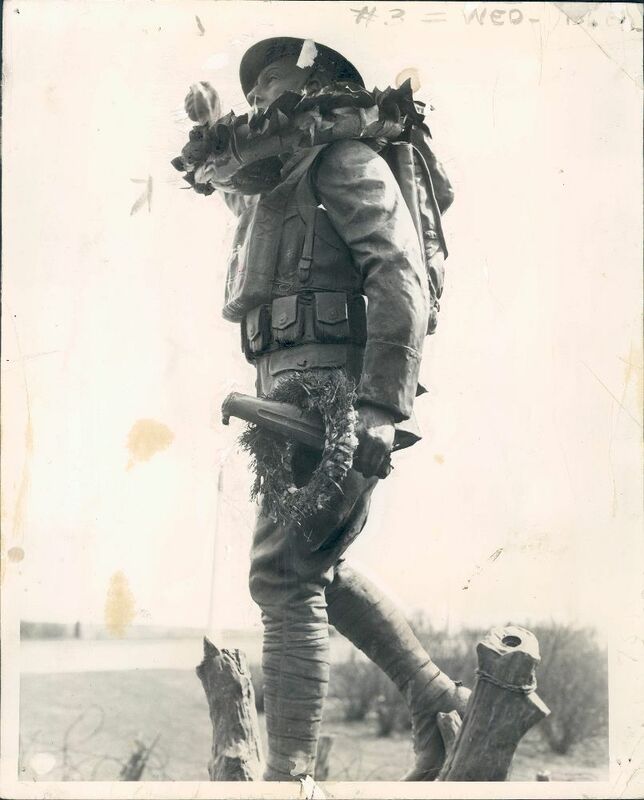 Pictures of this Doughboy appeared in many forms, including postcards (above) and Viquesney brochures. Photo: Keystone-Mast Collection, UCR/California Museum of Photography, University of California at Riverside. 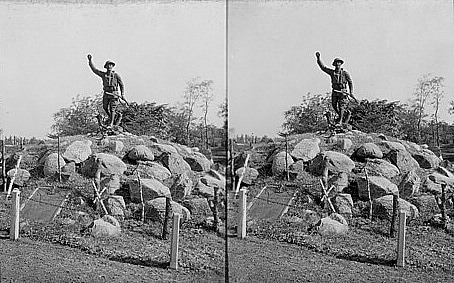 Above: An undated stereo photo showing the complete statue, probably taken shortly after its 1927 dedication. 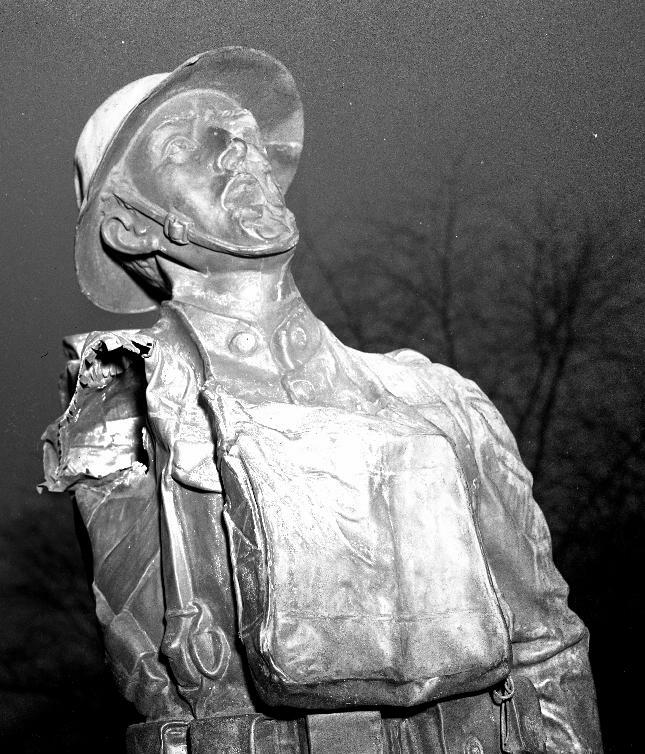 Damage to the statue was noted as early as two years after its installation. This Doughboy has had a terrible history. The photo below, left, was taken by the grandfather of Kenneth Berchem-Nigg in 1929. Ken's grandfather circled the damage that had already occurred to the bayonet, gun barrel, and sling after only two years. ​The photo below on the right, sent in by site visitor Teresa Rodriguez, also appears to have been taken around 1929. The bayonet is now gone, and the left side and bottom of the frame around the plaque has been damaged. On its simple earth mound setting, the Doughboy was easily accessible and prone to vandalism. Photo provided by Kenneth Berchem-Nigg. Photo provided by Teresa Rodriguez. April 7, 1937, press photo of damage. 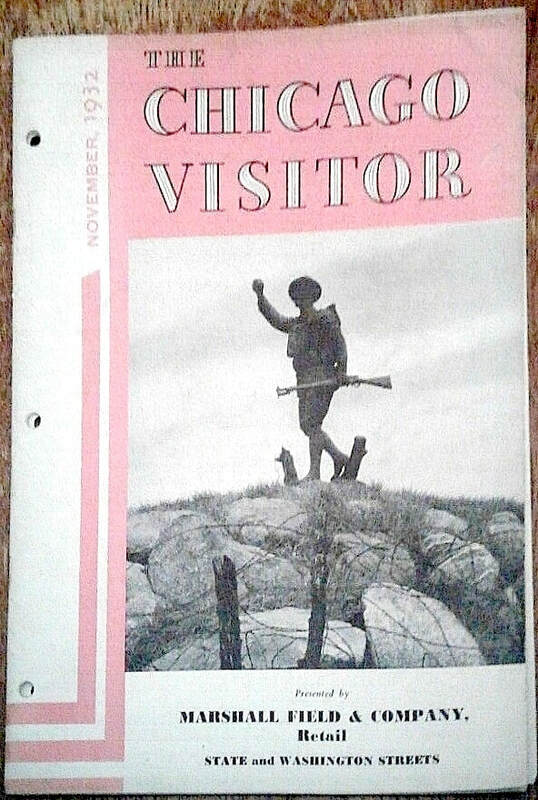 Above, left: In advance of the 1933 Chicago World's Fair, the Doughboy was featured on the cover of The Chicago Visitor, November, 1932. Now not only the bayonet is gone, but also the rifle sling. 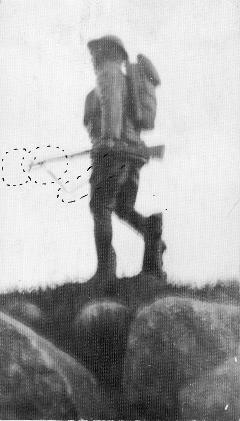 In April of 1937, above, right, most of the rifle had been ripped away. 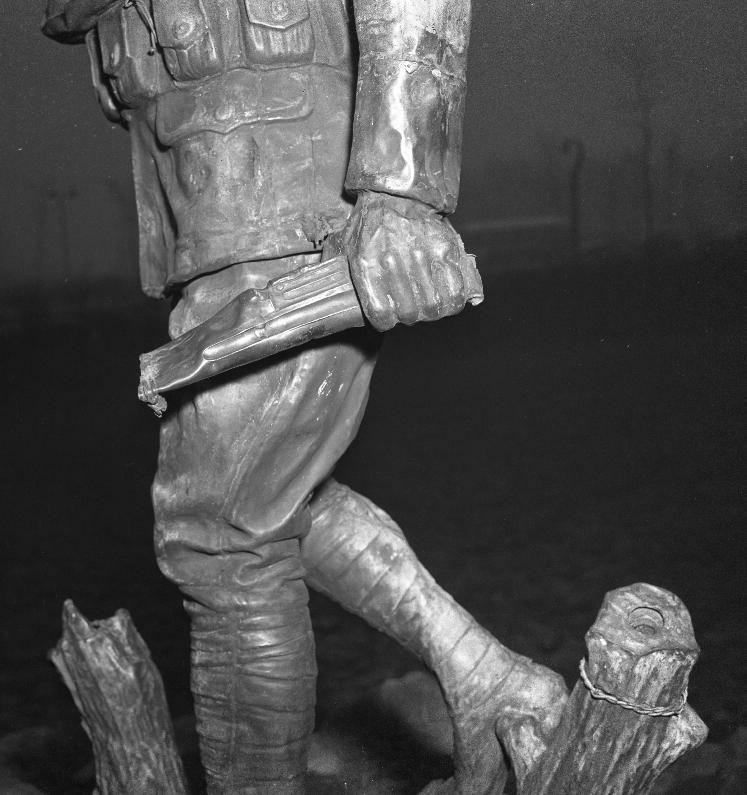 The final insult: In 1945, the sculpture was further vandalized, with the face smashed in and the right arm torn off. And as if any more damage could be inflicted on what remained of the rifle, it was bashed in on the end and twisted down, bending the wrist. A newspaper article of the time blamed "pacifists" for the damage. As a result, the statue was removed by the Kiwanis Club in 1946 and possibly placed in storage somewhere. Any information as to what happened to it after it was removed would be welcome.